These are so good I had two last night after I made them - one for breakfast, and then another while I was taking these photos! Oh, and those ones you see in the photo to your right? I’m eating them right now as I type this. Anyway, I hope that any Irish folks out there won’t take offense to my alterations, but I found it a bit plain all on its own, and very potato-y. Boxty is really just mashed or grated potatoes, some milk and some flour (although everyone seems to have a variation on that), then fried in butter or oil. I wanted something with a bit more nutrition and flavour, but maintain the concept of a cheap potato pancake. Also, some people with OralAllergy Syndrome (like me) have problems with white potatoes. So, I used half sweet potatoes (also because I got a 5lb bag for cheap at the farmer’s market this weekend) and half russet potatoes instead of all russets. Sweet potatoes are healthier than regular potatoes – they have Vitamin A and C, beta-carotene, iron, and all kinds of other good antioxidants and minerals, but without the starch of regular potatoes. These make super cheap, gluten free pancakes, and can be had any time of day, breakfast, lunch, tea time, or for dinner. Jazz them up with sour cream or yogurt (as I’ve done here), or syrup, whipped cream, jam, fruit, or even use them as a cheap, gluten free sandwich bread. A bag of potatoes is cheap, and if you boil or bake several at once, you can use the rest for regular mashed potatoes, gnocchi, or shepherd’s pie. Alternatively, if you have leftover mashed potatoes, use them to make this Irish boxty! * Can substitute potato starch, or a gf flour if desired. I used cornstarch because it’s cheap and it binds the pancake together well. ** I grind my own rice flour with my coffee grinder, it’s slightly grainier than store bought, but in small amounts I don’t notice it at all, and it’s much cheaper than buying rice flour. 2. Peel the remaining potatoes and cut into large chunks. In a large pot, cover and boil the potatoes in salted water until tender, about 15 minutes. 3. With a fork, mash the potatoes with ¼ cup of the milk in a bowl until smooth. Add in the grated potato. 4. Whisk together the remaining ½ c milk with the egg, corn starch, flour, salt and pepper until smooth. Add to the potatoes and mix until smooth. Add any desired seasonings and blend again. 6. Fry with a lid on for 4-5 minutes, until nicely browned on the bottom. Flip, and fry 4-5 minutes uncovered on the opposite side. 7. Remove from heat and repeat. Serve warm with toppings. *Some people use all grated potatoes while others use all mashed potatoes. Since I was using sweet potatoes I felt they would be better mashed, but wanted some grated for texture, and to lessen the starch. This is simply personal preference and if you want to skip the extra step of grating the potatoes you can use all mashed instead. I readily confess I’m not very familiar with Irish cuisine, but am experimenting with Irish foods for this week’s theme. 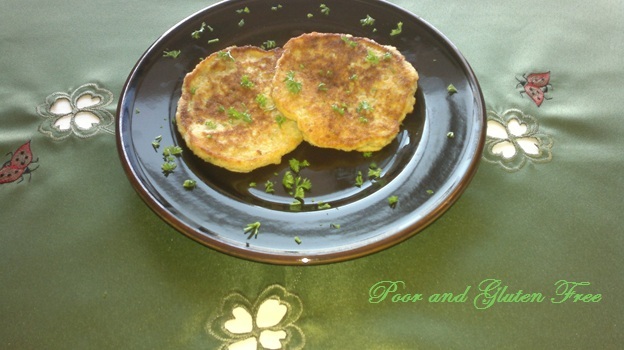 If you have a favorite Irish dish, or an experience with boxty, I’d love to hear about it! *OAS Info: Potatoes are a common OAS food. The boiling and cooking process here *should* kill the allergen proteins and make them safe to eat, but if in doubt use all sweet potatoes instead, or avoid altogether. What's the measurement unit for cornstarch?